In July, 2017, Nancy B. Samuelson was honored by the Wild West History Association (WWHA) with a Lifetime Achievement Award. Presented at the Tenth Annual WWHA Roundup. July 12-15, 2017 Fort Worth. NANCY B. SAMUELSON is a native of Missouri. She was born in Dent County, the daughter of Raymond and Rosa Dalton McDonough. Nancy is distantly related to the Dalton Gang through her common ancestor Timothy Dalton, who first appeared in Albemarle County, Virginia about 1732 and was known to the James ancestry of Frank & Jesse James, and their in-laws among the Vardeman family. Academic credentials include a Bachelor of Arts degree from Harris Teacher’s College, St. Louis, Missouri, and a Master of Business Administration degree from Syracuse University. Nancy retired from the U.S. Air Force in 1984. She served for twenty-four years in a variety of management and command positions in the logistics career field. She also has considerable teaching experience. 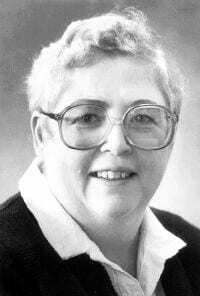 She taught at Park College and at the University of Connecticut. She also is a graduate of Armed Force Staff College and Air War College. Awards and decorations include the Bronze Star and Meritorious Service Medals. In retirement, Nancy has proved a prodigious researcher, author, and teacher for countless civil organizations, history, and military groups. 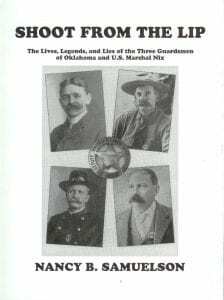 She regularly produces articles, book reviews, and history presentations for The Western Outlaw-Lawmen Association, the Wild West History Association, Oklahombres, The James-Younger Gang, and here at Stray Leaves for the Jesse James family. She also is a regular contributor to countless civic and military interest groups. 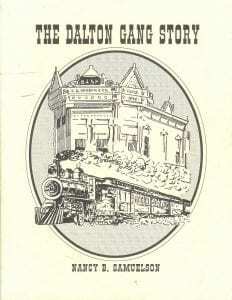 Nancy B. Samuelson is the author of The Dalton Gang Story (Softcover, $28 including shipping) and Shoot from the Lip (Hardcover, $38 including shipping), available through Shooting Star Press, 8962 Canberra Dr., Sacramento, CA 95826. For a personally autographed copy of Nancy’s books, contact Nancy at nancysamuelson@att.net.